Sevendust lead singer Lajon Witherspoon has high hopes for his band's latest single, 'Unraveling,' the debut track from their forthcoming album 'Cold Day Memory.' "You have a lot of people out there who will say, 'Oh man. That's radio friendly,'" Witherspoon told Noisecreep via telephone from Indianapolis. "Well, you know, it's damn good, though. You can listen to it in your car driving to work. So I don't think we would ever be a sell out, but we've grown by being able to just play the music we enjoy. This might be the song of the summer." 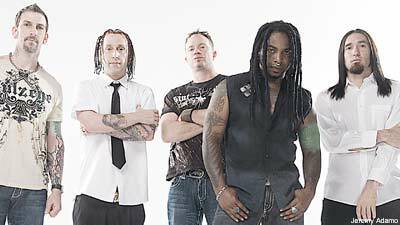 With back to back double-digit add weeks at Active Rock before its actual add date this week, 'Unraveling' is the most well-received Sevendust track in the last decade, according to their publicist. The song is now available on iTunes and is available to stream on Sevendust's MySpace page. Witherspoon explained that it's a song most people can relate to. "It's about everything we go through in our lives," he said. "You can only write about situations that happen to us in everyday life. We're the same as everyone else. We worry about bills. Life problems. Relationships. The kids. Everything. We go through it all. I guess it goes along with feeling like it's unraveling. I can't wait for everyone to hear the rest of [the album]." Plans for the video are currently being discussed, Witherspoon said. But for now, like radio, the song is being embraced at live shows. "We're trying to get this tour under our wings," he said. "The album comes out on April 20. So it's pretty much like a prelude. Getting the engines rolling again. We're playing 'Unraveling' in the set, same with 'Forever Dead.' When the album comes out, we'll start playing more songs. It's really exciting. The crowd seems to be responding very good."